We are now in Todra Gorge which is in the South of Morocco. It is quite picturesque and reminds us a little of the entry to Jenolan Caves. We have been in Morocco now for over a week and have struggled to find reliable internet. Even purchasing a SIM card hasn’t helped as we have not been able to activate it as you need to send a text message (not possible from our iPad) and it is a different size sim to our phones. Hence the reason for our lack of blog entries. We stopped over in Singapore for a day en route to Casablanca. We had planned on visiting the new aquarium (the biggest in the world) but the crowds and queues were too long so we walked around parts of Sentosa Island we hadn’t seen before. We will attempt to see the Aquarium on our way home where we will have 3 days in Singapore. It was very hot during the day but we enjoyed air conditioning and cool drinks whenever possible. Our overnight flight to Barcelona left at 12.40am so it was a long day. We both slept a good number of hours during the 13 hour flight. A quick change of planes at Barcelona saw us on our way to Casablanca via Madrid, flying over the rock of Gibraltar as we crossed from Europe to Africa. Casablanca does not seem as romantic as it should be. It is a thriving metropolis with the key tourist attraction being the Hussain II mosque which we visited and took an extensive tour of the interior. It is the third largest mosque in the world and the largest outside of Saudi Arabia. It is very beautiful with a roof that can be opened silently within 3 minutes. it can cater for 10,000 worshipers inside and 50,000 in the outside courtyard. 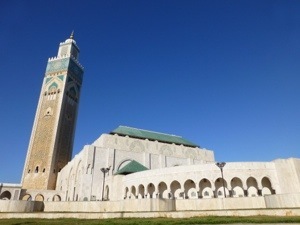 The only material in the mosque not native to Morocco is Italian marble. 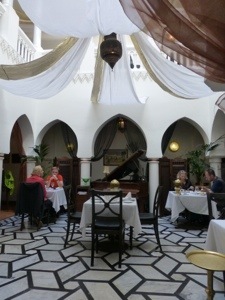 Following our visit to the mosque we went for lunch at Rick’s Cafe which was made famous by the 1942 movie “Casablanca”. Whilst the movie itself was shot in Hollywood, some entrepreneurial person has created the cafe (no doubt mainly for tourists). Lunch was delicious and the building and courtyard were a recreation of the original movie set. On our second night in Casablanca we started our Intrepid tour with an introductory meeting at 6pm. There are ten on the tour – 6 Aussies (ourselves, a young couple (Luke and Michelle) and a single woman (Amy) from Melbourne and a doctor (James) from Ballarat), 1 New Zealander, Chiu, from Auckland, who is the long distance partner of James from Ballarat, 1 German, Sandra, and 2 Russians, (mother and son) Natalia and Max. We are all getting on well and our tour leader, Hassan is leading us around and showing us the ways of Morocco. The cuisine so far as been quite similar in all the places we have been. It consists of tagines, cous cous, skewers, moroccan salad followed by mandarins for dessert with plates of olives and baskets of bread at every meal. Hassan generally reads every menu to us but there is generally no need as we are all familiar now with the options. Mint tea is readily available everywhere but varies between regions. It is very sweet (think 2 heaped teaspoons of sugar per glass) and is poured from metal teapots which are raised to a great height as the tea is poured. Sometimes the mint leaves are in the pot whilst at other times they are in the glass. It can be quite refreshing and is also used as a welcoming drink in hotels etc. Following Casablanca, we caught the local train to Rabat (capital city) and visited the Kasbah for a mint tea followed by a walk to the mausoleum of the immediate past king. 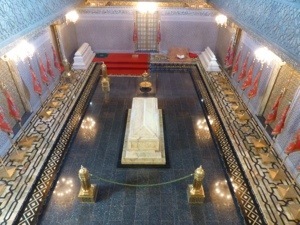 The mosaics inside were simply stunning and the guards on duty were wearing national costume. Mosaics and tiles are a key feature of the architecture of Morocco and we have seen many fine examples in numerous buildings. Following our brief stop in Rabat we boarded the train to Meknes. It was extremely crowded and many of us had to stand for a while until seats became available. Local kids on the train were quite fascinated by us foreigners and despite the language barrier we introduced ourselves and had a very basic conversation with lots of hand movements. Morocco has two national languages – Arabic and French. All signs are written in both languages and English is quite limited but there is enough to get by. Meknes was once an imperial city and the capital of Morocco. Sultan Moulay Ismail set about to build his own version of Versailles. 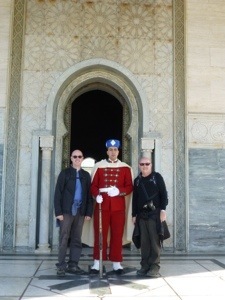 With a local guide we explored the stables and granieries as well as the tomb/mosque of the Sultan. Following this we went to a local restaurant (hole in the wall seating for only 5 people at a time) in the medina, for a camel burger. It didn’t taste anything special and could have been any grilled lebanese meat wrapped in pita bread. 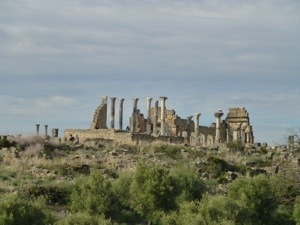 From Meknes we travelled to Volubulis which was once a Roman city. We explored the ruins, once again with a local guide who was very passionate about the history and he helped recreate the houses and streets so we could further understand how the people lived during this time. To finish the day we travelled onto Fes where we would stay for two nights. Sounds absolutely fabulous! Mmmmm I love Morrocan food! Enjoy and take care! Stay safe as always! We had same guide! Can’t wait to see your photos when you get hone!